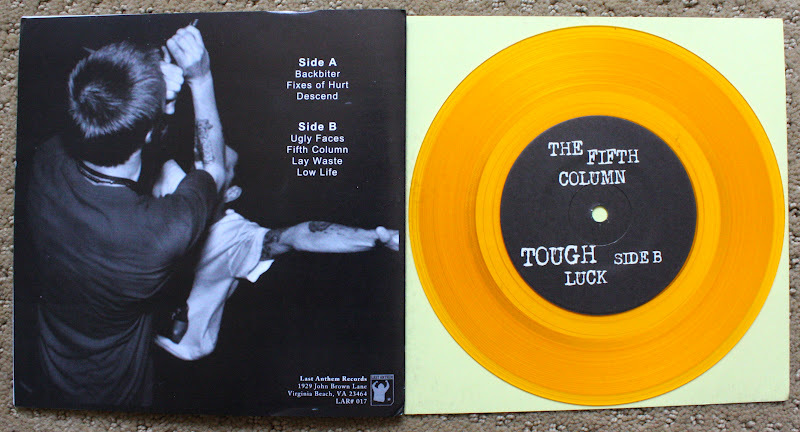 Here's my copy of Tough Luck - The Fifth Column. I recently picked this up from Mind Rot when I was ordering Break Away's 7" package, and this is one of those I basically picked off of the cover art alone. The artist who did this has also done T-shirt's for Backtrack and Downpresser and some other bands too I think. Coincidentally, these guys are very similar to both the bands I just mentioned, which is a good thing. It's actually a really good thing. I'm glad I scooped this because this is actually an excellent little 7"! It's not anything new or ground breaking but it is done with great execution and vocals. The music is heavy as all hell. This thing's so good I may actually have to order all three colors from Last Anthem Records.